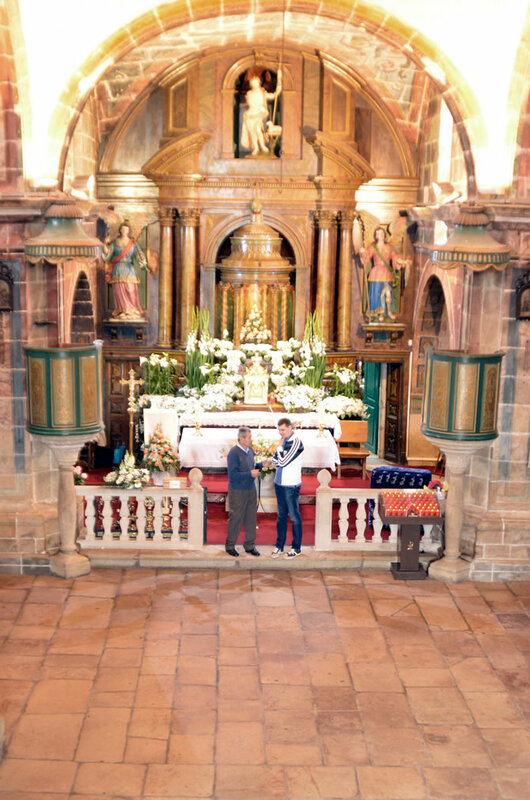 Inside the Sanctuary of Our Lady of O Corpiño, it is clearly revealed the older building. The remains can be seen in the lower part of the temple and are made in granite ashlar. The reform of 19th century regularized the cut of the stones. It gives a more homogeneous and aesthetic appearance in the transept and in the access to the side chapels. The central nave is covered by a barrel vault and is marked with arches. The crossing is covered by a dome on pendentives with a lantern. The presbytery is covered by a beautiful groin vault ornated with beautiful mural paintings of vegetables in scrolls. It is divided into four parts, framing different anagrams and scriptural symbols: the anagram of the Virgin Mary (the M and the A intertwined), the Lamb lying on the book with the Seven Seals, the Dove that represents the Holy Spirit and the Tablets of the Law given by God to Moses. The side naves are covered by impressive flat roof formed by colossal ashlars stone. This are supported by slender pilasters. The exterior shows an elegant design of neoclassical layout, which frames the central gable of the original construction. The superposition of orders in the four angles are exceptional. The first floor is framed by four big Tuscan columns. In the upper floor there are other columns more trimmed with a very original order between the Ionic and the composite. They are framing white marble tiles with Mary’s anagram. This is only the start of the four unfinished towers as they ends at the cornice level. In the central part is the main door which is framed by a simple stripe. Above the door is a niche with a beautiful and very old image of the Virgin. It is in front of a window that iluminates the choir and the central nave. All is finished with a slender belfry with an octagonal lantern. It maintains certain resemblance to the belfry of Santiago of Compostela designed by Simón Rodríguez. On the rear façade, which hides the sacristy and the original presbytery there is an layout similar to the front but there are larger rooms at the upper part of the corners. This rooms would be the lower body of the towers. They have ironwork balconies and are finished with apple shaped urns decoration. They also are flanking the central top that occupies an upright belfry. Finally, we see a wall with a total absence of openings, a fact that is also seen in the drum that masks the dome on the transept. This reduces the entrance of light to the upper lantern that crowns the building. All the edification is covered by a gable roof. 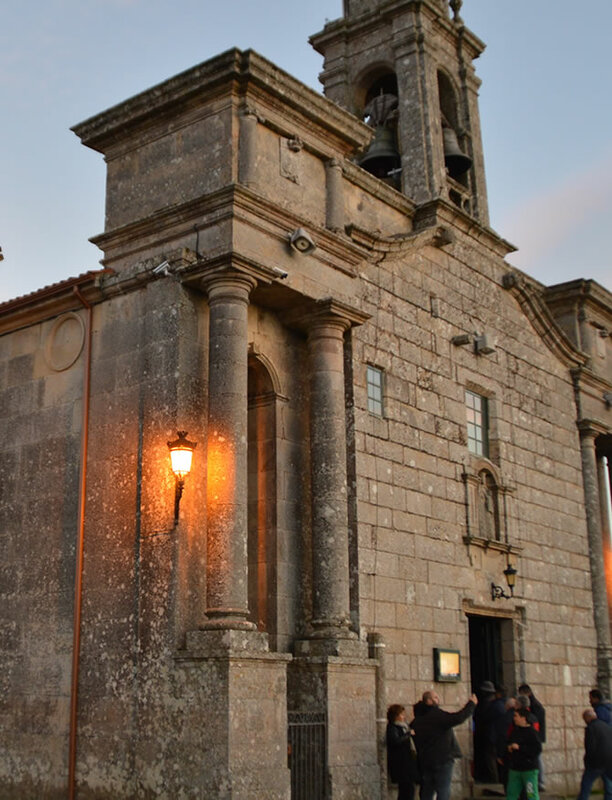 As conclusion, we can say that this temple reveals a perfect combination of the sobriety and elegance of the Galician religious architecture. 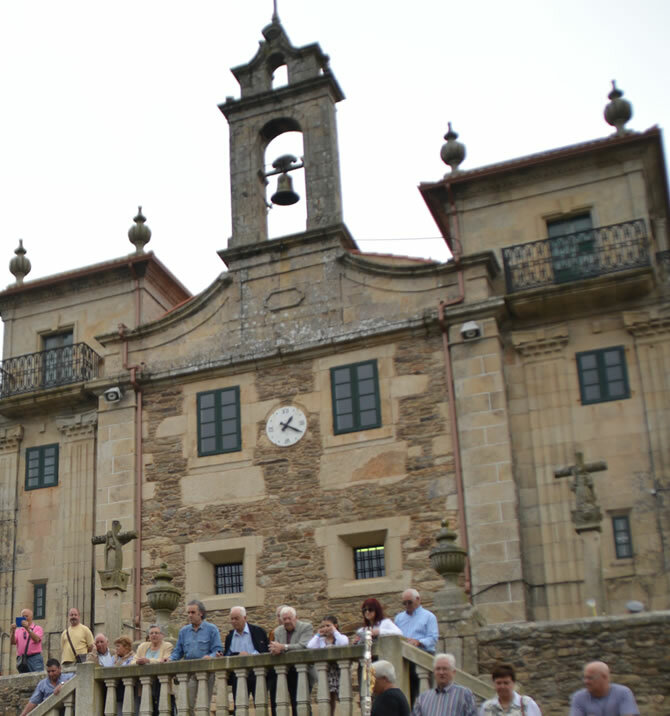 This is the Marian shire most visited in Galicia and the most representative of the Marian devotion throughout the centuries.